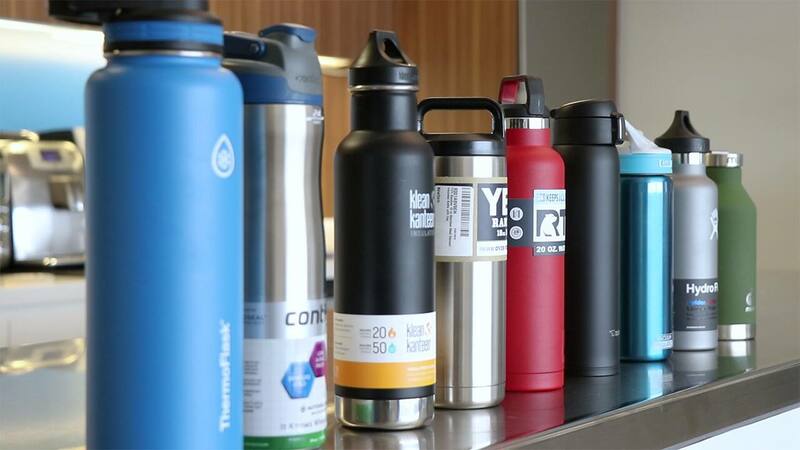 Slickdeals News & Articles News Insulated Water Bottle Comparison Test: Are Expensive Brands Better? Do premium brands actually keep your drinks colder for longer? Author's note: We created this exercise as a fun and casual way to get a feel for how different water bottles perform when regular people use them in their daily lives. This is not meant to be a scientific experiment with lab-based performance benchmarks. Reusable insulated water bottles are always popular on Slickdeals. In fact, we it's not unusual to see three or four water bottle discounts hit popular deals or the Frontpage every month. But are premium brands like Hydro Flask worth it? After all, the ultimate measure of a water bottle is how long it will keep your drinks cold. So, we struck out to see how 10 different water bottles performed under realistic scenarios. Hopefully, this information will help you choose between the premium brands (which can cost between $30 and $60 a bottle) and a more affordable $15 water bottle. To find out the best brand of tumbler to keep your drinks hot, check out our Tumbler Comparison here. Each of the 10 water bottles was filled approximately halfway with ice and topped off with water. We then measured each bottle's initial temperature as a starting point. After that, the bottles were closed and left in their testing conditions for six hours. We recorded the temperature for each bottle on an hourly basis. We tested the bottles in two different, common scenarios. For the first test, the bottles sat outside in direct sunlight for six hours. For the second, they were in the backseat of a car parked in direct sunlight for six hours. In both cases, after the test the bottles came inside our air conditioned office for another 18 hours to monitor temperatures overnight. We did that more out of curiosity and realize most people probably don't drink their water 24 hours after filling up their bottles. 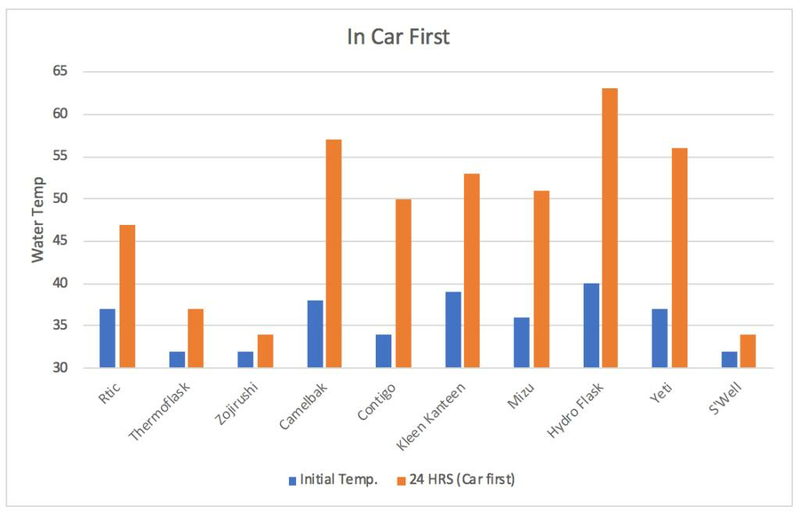 Here are the temperatures we recorded after leaving the bottles inside over night after each day of testing. As you can see, the results varied quite a bit. Which Water Bottle Should you Buy? Now, we went into this test anticipating that most water bottles would perform more or less the same. 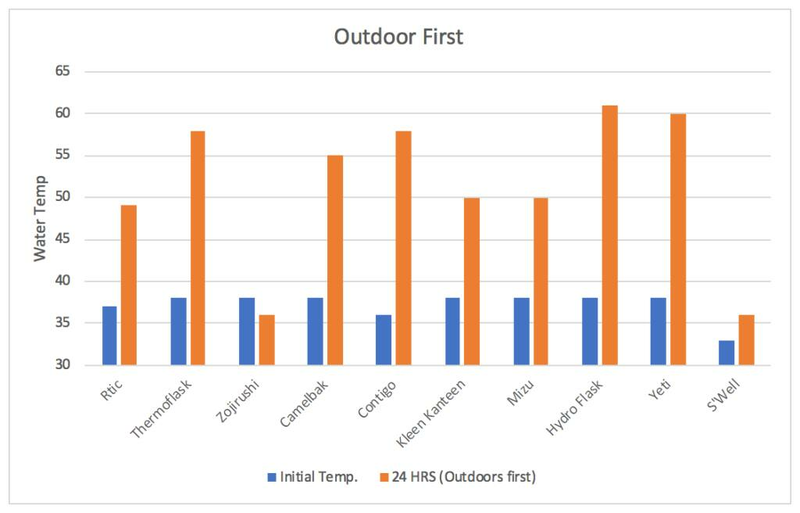 While that proved to be essentially accurate, two of the more expensive, recognizable brands -- Yeti and Hydro Flask -- actually performed the worst compared to the other brands. 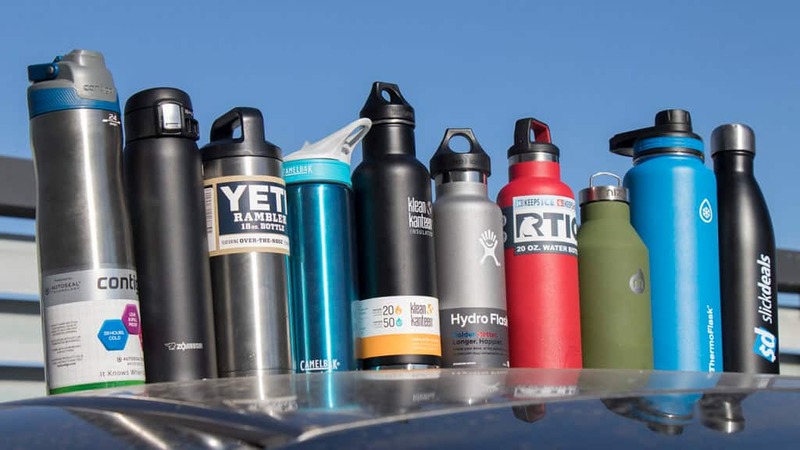 During the car test, the Yeti and the Hydro Flask got warmer while other brands like RTIC and Contigo cooled down. Let's be honest, it's unlikely you'll be able to tell the difference between water at 38 or 40 degrees Fahrenheit. However, this test goes to show you don't have to break the bank to get a high-quality water bottle. And while the relatively expensive S'well (~ $45 and rarely go on sale) had the best, coldest results by far, some people might not actually want to drink near-freezing water all day. You could obviously solve that by putting in less ice (or none at all). In the end, most of these bottles provide exceedingly similar performance. If you happen to like the way one brand looks over the other, go for it and make the purchase. Just make sure you wait until it's on sale and you see it on Slickdeals. We've seen some of these brands go for as low as $10 to $15, and they're all perfectly capable of keeping your water cool. Do you own any of these water bottles? How do you like them? Let us know in the comments below!